There’s an emptiness at the center of It Comes At Night, the newest film in distributor A24’s ongoing effort to become a household name for highbrow horror fans. And depending on how you view its symbolically loaded yet narratively simplistic approach to post-apocalyptic cinema, that emptiness can manifest as either the cold pit that forms in your stomach in the face of abject terror, or the frustration of fumbling for a light switch in a dark, empty room. Those looking for an identifiable “it” to terrorize the small band of survivors holed up in the secluded cabin where most of the film takes place won’t find what they’re looking for, and those searching for a message to take away from the film—or neatly wrapped up plot points—will be similarly stymied. Instead, what we get is blind animal panic, a nihilistic lashing out at the darkness that will one day swallow us all. 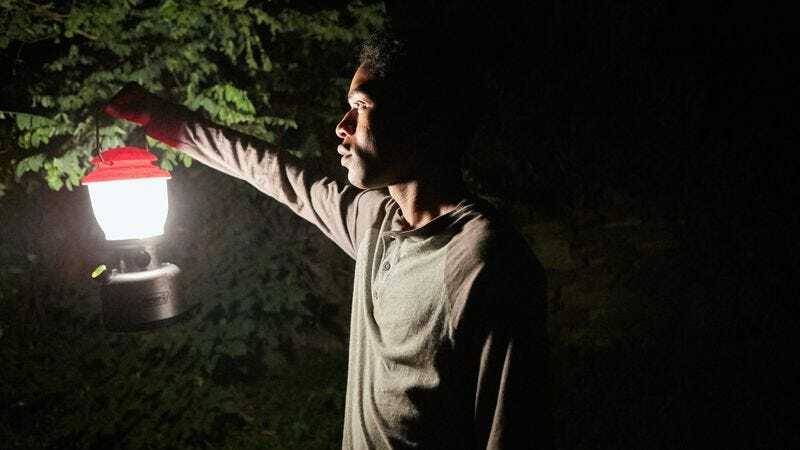 Like his debut feature Krisha, It Comes At Night was inspired by painful personal events in the life of director Trey Edward Schults, who wrote the film in the immediate aftermath of his father’s death. The rawness of that emotion translates to a palpable intensity, with the fear of losing those closest to you, either through death or through betrayal, smothering the film like a wet wool blanket. This is established very early on, as we open with a strikingly lit, morbidly beautiful image of an elderly man whose body is wracked with a bubonic plague-type disease, surrounded by people in gas masks in a room covered in plastic sheeting. We soon find out that the tearful visitors are the man’s family members, and the bullet they put in him before burning his body was an act of love. Although the plague that’s ravaging the world outside of the family’s isolated forest retreat is never named—and as far as we know, those who die from the disease stay dead—it’s difficult to not think of zombie movies, specifically George Romero’s Night Of The Living Dead. That’s partially due to It Comes At Night’s violence, paranoia, and feeling of being constantly under siege, and partially due to Schults’ casting of black actors, still a rarity in the horror genre. That being said, race doesn’t really factor into the story, which is about as stubbornly apolitical as you can get. This is a very streamlined film, focused on the dynamics between survivalist patriarch Paul (Joel Edgerton); his shy, kind, heavily armed wife Sarah (Carmen Ejogo); and their teenage son Travis (Kelvin Harrison Jr.) That dynamic is exploded, rebuilt, and exploded again after a stranger named Will (Christopher Abbott) tries to break down their front door late one night. After determining that Will is healthy by chaining him to a tree overnight, Will persuades Paul to give him a ride in his truck to go pick up Will’s wife Kim (Riley Keough) and young son Andrew (Griffin Robert Faulkner), bringing them—and their extra food—back to the cabin with them. But while there is safety in numbers, there are also tensions and misunderstandings. The quiet that settles over the group’s strictly controlled daily routine is short lived, leading to a real gut punch of an ending. We see all of this through the eyes of Travis, who serves as a stand-in for both the audience and for Shults himself. Harrison gives a standout performance as the confused, grieving son, conveying his isolation and apprehension through simple gestures like his sheepish smile and downcast eyes when Kim asks him if he’s ever kissed a girl during a late-night chat around the kitchen table. Travis’ bloody, surreal recurring nightmares also provide the film with its one opportunity for supernatural horror imagery, with the rest of the film dominated by the grim utilitarian trappings of Paul’s doomsday prepper lifestyle and the blunt savagery of wilderness survival. That’s not to say that Schults completely resists the temptation to deploy haunted-house tricks: Booming soundtrack cues, “it was all a dream” fake outs, and sudden outbursts of intense violence all pop up occasionally to supplement the steadily building tension. That tension is reinforced by the relentlessly claustrophobic cinematography, which makes extensive use of tight close-ups and practical light from lanterns, flashlights, and even the sight of a rifle during one especially stressful scene. At the center of It Comes At Night is the image of a red door at the end of a long, dark hallway, lined with wood paneling and hung with a combination of family photos and a nightmarish plague scene by 16th-century Dutch painter Pieter Bruegel The Elder. The door is never, ever supposed to be opened after dark, but when it is, all we see is blackness on the other side. Maybe there’s something out there, or maybe there’s nothing at all. 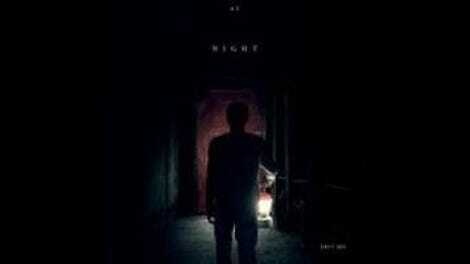 Most horror films presuppose that the former is the scarier of the two options, but It Comes At Night is more concerned with the seemingly bottomless depths of the unknown.